Louie Stowell's debut series - THE DRAGON IN THE LIBRARY - was snapped up by Nosy Crow and will be published in 2018. Her second series, also sold to Nosy Crow, will be published a year later. With a solid background commissioning non-fiction for children Louie Stowell – who is Editorial Director at Ladybird – is also a dab hand at writing non-fiction books for children. 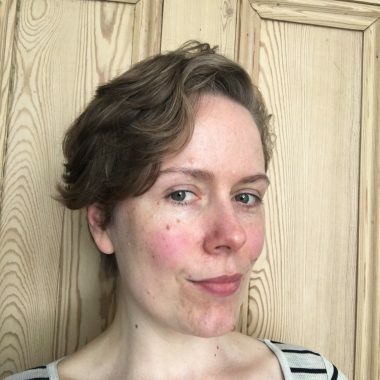 As well as having an in-depth knowledge of everything from computer coding to spaceships, she also draws cartoons online (and in the occasional zine) and runs comics workshops at literary festivals and in schools. Louie grew up in London, obsessed with comics, playing at elves in caves in Kent, and running feral in the scrubland by the Thames. She now lives in Hackney with her wife and their dog, Buffy, who is small and fluffy and highly unlikely to slay vampires, unless they’re getting between her and some bacon. Louie’s first novel will be published in 2018, with subsequent books coming six months apart. I used to write stories as a child, and I just kept going. I used to read a lot of very gruesome comics, so my stories were pretty disgusting and violent and definitely not suitable for children. I also kept a diary from the age of about 11, but no one will ever read that. At least not while I'm alive. Anything by Jan Pienkowski - the MEG AND MOG books were my first love, but he also did a brilliant book about an alien called Gloop. But my ultimate storytelling hero as a child was Tolkien. The epic scale of the world he created was incredible to me - it felt real. I loved that he wrote whole languages and histories for his characters. I wrote my first book after leaving university. I was living with a roommate and wrote in my dressing gown before work and after work. The book is still in a drawer. It was about a half vampire, half fairy that gave you a wish in return for your blood. There was time travel, and the Roman Emperor Caligula. Very hard. Very painful. So much waiting. But talking to people in the same boat really helped - I quickly learned to lean on fellow writers. I was lucky enough to get offers of representation from a few agents, but I loved the fact that Polly had a really strong editorial background - I work quite collaboratively, so having someone who was used to going back and forth with writers was really appealing. I actually found Polly by chance - I did an event at a bookshop (I write non-fiction books as my day job) and got chatting to the bookseller and children's author, Jennifer Bell . . . then met her again at an event called Drink YA (highly recommend these - they are organised by two bloggers, Jim Dean and Julianne Benford - and open to everyone interested in children's books and YA) and she recommended sending it to her agent, Polly. So, the moral of the story is: chat to people at internet meet-ups, you never know where it might lead. I usually write at the weekend, though occasionally before work. I never write for more than a couple of hours at a time - then I go for a walk. I love writing in cafes, preferably soulless chain cafes, although anywhere with good coffee and comfortable chairs will do. I like to plan the whole book first, but also do a more detailed plan for each smaller section immediately before I write it. Chatting through ideas with my wife is invaluable - she's a genius when it comes to plot solutions. I don't think I really 'look' for inspiration, it's more a matter of all the ideas I've ever read or come across swirling around in the back of my mind and combining themselves into new shapes. Also, I believe in just getting it done - putting in the time, sitting down, writing, and not waiting for inspiration. This is why I love deadlines. Don't expect your first book to get published. Or necessarily your second. I wrote about three novels before I got a book deal. Practice makes perfect, and timing is everything - your book has to land on the right desk of the right agent, then the right editor, in the right mood, at the right time. I don't believe the best books get published. Don't feel bad if yours doesn't. Publishing is a business, and it's one run on hope and hunches. It's not personal, and it's very important to remember that. Utter nonsense gets published. Great works of genius don't. It's just luck and persistence. a) Learning to write what you want to write, and not what you think you should. That took a while. b) Fanfic helped me a lot. It gave me fluency, because it takes the pressure off - you're not writing fanfic to make money or get a book deal, it's just for the joy of exploring characters and worlds. Also, making ludicrously complicated in-jokes that only nerds will get. I would invite Tolkien and CS Lewis, and watch them bicker about Catholicism and elves. I'd also invite Ursula LeGuin, PG Wodehouse, Richmal Crompton and Jan Mark. Oh, and Nnedi Okorafor.